Use the GIS Portal below to access interactive Geospatial Information Systems (GIS) data and maps. The Geospatial Technologies Team provides GIS support services for the Maryland Department of Transportation, State Highway Administration (MDOT SHA). MDOT SHA works with federal, regional, State and local governments and other organizations to combine geospatial initiatives. Geospatial data can help you make smarter and informed decisions. MDOT SHA offers many ways to interact and fully leverage the power of geospatial technologies. 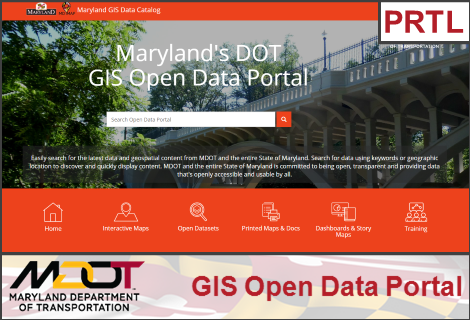 The portal connects you to the latest data and geospatial content from MDOT and the State of Maryland. This is a compilation of MDOT GIS datasets from Maryland’s GIS library. These maps display a range of information, including roadways, administrative boundaries, traffic and truck volume. These are easy-to-read applications providing context graphically through focused graphs, charts, tables and maps. Explore and understand complex datasets and the stories behind them at a single glance. GIS Training programs offer Maryland State employees classroom and online GIS instruction.